Zaha Hadid Architects often mentioned among the studio influences Spanish-Mexican architect and engineer Félix Candela and his thin-shell structures. In an installation at the 13th Venice International Architecture Biennale, Hadid's models were indeed surrounded by the work of Candela and of other architects such as Heinz Isler and Frei Otto, all focusing on materials and fluidity of forms and spaces. Candela (1910-1997) gained recognition in his life for his thin light concrete vaults and in that particular installation Hadid's display featured models of Candela's Parroquia de San Antonio de las Huertas in Miguel Hidalgo and of his Caseta de ventas del Fraccionamiento in Verde Valle, Guadalajara. The studio recently took its passion for Candela to the next level dedicating to him a knitted textile and concrete structure dubbed KnitCandela. The experimental structure was built at the Museo Universitario Arte Contemporáneo (MUAC) in Mexico City as part of Zaha Hadid Architects' first exhibition in Latin America (until 3rd March 2019). KnitCandela consists in a sinuous concrete shell structure made with new computational design methods on a ultra-lightweight knitted formwork. 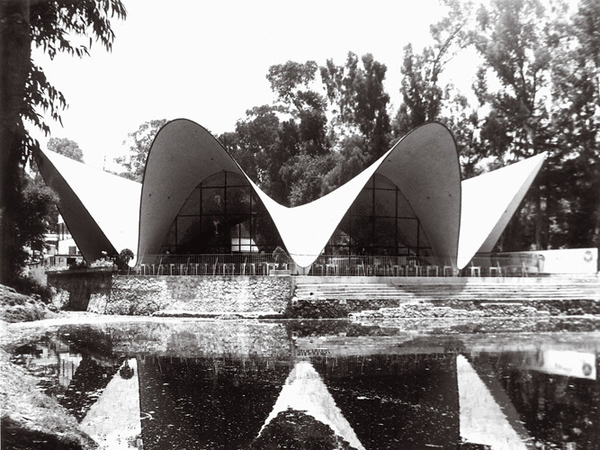 KnitCandela's shape hints at Los Manantiales, a restaurant in the Xochimilco area of Mexico City designed by Félix Candela that consisted in a shell formed by four curved-edge intersecting hyperbolic paraboloids (or "hypars") creating an eight-sided groined vault (this wasn't the first groined vault structure Candela designed View this photo). The result was a structure characterised by a graceful continuity that looked like a lotus flower floating in the air. Candela developed the main concept behind this structure in several of his subsequent projects. KnitCandela combines a design by Zaha Hadid Architects' computation and design research group (ZHCODE), engineering by the Block Research Group (BRG) at the Institute of Technology in Architecture at ETH Zürich, and fabrication by Architecture Extrapolated (R-Ex; the architectural agency managed the execution of the project on site in Mexico City). There are differences between Candela's design and the structure that Zaha Hadid Architects and its collaborators dedicated to him: Candela combined hypars to produce reusable formworks and reduce construction waste; Zaha Hadid Architects' structure is made with KnitCrete, a formwork technology that allows for the realisation of a much wider range of anticlastic geometries. Developed at ETH Zürich by the Block Research Group in collaboration with the Chair for Physical Chemistry of Building Materials, as part of the Swiss National Centre of Competence in Research (NCCR) in Digital Fabrication, KnitCrete is an innovative material-saving, labour-reducing and cost-effective formwork system for the casting of doubly curved geometries in concrete. The system employs a 3D-knitted, technical textile as a lightweight, stay-in-place shuttering, coated with a special cement paste to create a rigid mould, supported by additional falsework elements such as a tensioned cable-net or bending-active splines. In a press release, the researchers behind KnitCrete highlight how knitting minimises the need for cutting patterns to create spatial surfaces, allows for the directional variation of material properties and simplifies the integration of channels and openings, to insert additional formwork elements such as insulation, reinforcements, electrical components and technical systems for heating and cooling. The cable-net and fabric formwork system allow to build concrete surfaces in an efficient way, without the need for complex moulds. Besides, the structure is designed to be built in a short time, restricted space and with minimal budget and it is easily transportable (the textile formwork for this project was carried from Switzerland to Mexico in a suitcase) reducing in this way the need for additional supporting structure and scaffolding, and simplifying the logistics on the construction site. The 55-kilogram formwork (30Kg cable net and 25Kg knit supporting 5 tonnes of concrete) for KnitCandela comprises four long strips ranging from 15m to 26m in length. Each of the four strips is a seamless, double-layered textile produced as a single piece. The heart of the concrete shell was knitted by an industrial knitting machine following a digitally generated pattern: it took 36 hours for the machine to knit a fully shaped, double-layered 3D textile with a polyester yarn. The visible inside is an aesthetic surface that displays a colourful pattern and reveals traces of the supporting cable-net falsework system; the exterior surface allows to insert, guide and control the position of additional formwork elements. Standard modeling balloons for pockets were inserted between the two layers that become cavities in the cast concrete, forming a waffle shell that does not need a complex, wasteful formwork. There are some fashion connections in the fabric knitted for this project: the soft geometries and colours for the textile shell were borrowed from the traditional dress of Jalisco, but the local builders who assembled the structure dubbed it "sarape", a reference to the striped scarf that originated in Mexico. When the structure had to be assembled, the knitted formwork was tensioned between a temporary boundary frame in the museum courtyard and sprayed with a specially formulated cement mixture. This initial layer was just a few millimetres thick, but sufficient to create a rigid mould; once it hardened, conventional fibre-reinforced concrete was applied. The technology behind KnitCandela was developed by two doctoral students at ETH Zurich, Mariana Popescu and Lex Reiter, as part of Switzerland's National Centre of Competence in Research (NCCR) in Digital Fabrication research project. Popescu's research shows that employing knitted textiles in architectural applications cuts down on material, labour and waste, and simplifies the construction process for complex shapes. The KnitCandela project took indeed five weeks from the initial work until completion. But, while the history of architecture includes interesting experiences with concrete such as the Binishells, the most important technique behind this project remains knitting and consequently the possibilities currently offered by knitted or woven architectures. As Popescu states in a press release: "Knitting offers a key advantage that we no longer need to create 3D shapes by assembling various parts. With the right knitting pattern, we can produce a flexible formwork for any and all kinds of shell structures, pockets and channels just by pressing a button." Who knows, maybe in future the BRG may end up collaborating with some avant-garde knitwear designer, after all its founder Philippe Block claims that, to a certain extent, his group's method is a new form of 3D printing, "only it doesn’t require a completely new kind of machine. A conventional knitting machine will do just fine." The technology behind KnitCandela also represents an evolution of Block Research Group's previous flexible forming ultra-thin concrete roof systems such as the one employed for the HiLo, a doubly curved, concrete structure developed in 2017 and made of a network of steel cables and a sewn textile (the knitted shell for KnitCandela was instead produced in one go).